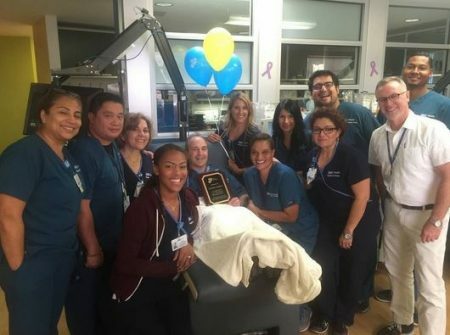 Congratulations to Matthew Hoffman for celebrating his 50th-gallon donation at the UCLA Blood & Platelet Center. 50 gallons is an amazing accomplishment and the result of 400 donations. Matthew started out more than 20 years ago donating platelets as a directed donor and then became a regular platelet donor visiting the center every two weeks, like clockwork. In 2006, Matt joined the Blood & Platelet Center family when a new position opened up. Thank U for your dedication! To make an appointment for a life-saving blood and/or platelet donation, click here.